The Gunung Leuser National Park, proclaimed in 1980, lies within the provinces of North Sumatera and Aceh. The Park is split into eastern and western regions by the Kuta Cane ‘rift’ valley running southwards from Gayo country in the highlands of central Aceh to Karo Batak country in North Sumatera. The Alas River flows from the western highlands of Aceh into this ‘rift’ valley following its course to the south. Excellent white-water rafting in rainy periods! Peaks, of interest to trekkers, lie in both the eastern and western sections of the Park. Those on the eastern side are of volcanic origin, and, on the western side, are of ancient, uplifted, sedimentary formations (non-volcanic). The Leuser Range lies in the western section of the Gunung Leuser National Park in Aceh. The National Park, in this region, is totally devoid of human habitation, and is billed as the largest wilderness area and longest wilderness trek in South-East Asia. There are three main peaks on the Leuser Range of interest to trekkers – Gunungs ‘Tanpa Nama’, Loser and Leuser. It is often assumed, incorrectly, that the highest peak on the Leuser Range is Gunung Leuser when in fact it is Gunung ‘Tanpa Nama’. Gunung Leuser is the lowest of the three peaks. BAKOSURTANAL, the Indonesian Survey and Mapping Agency, provides the names and locations of Loser and Leuser on their topographical maps. Gunung Leuser National Park (GLNP) authorities have adopted these names and locations consistent with those provided by BAKOSURTANAL in their brochure: Pendakian Gunung Leuser 3,119 MDPL (Climbing Mount Leuser 3,119 m ASL). 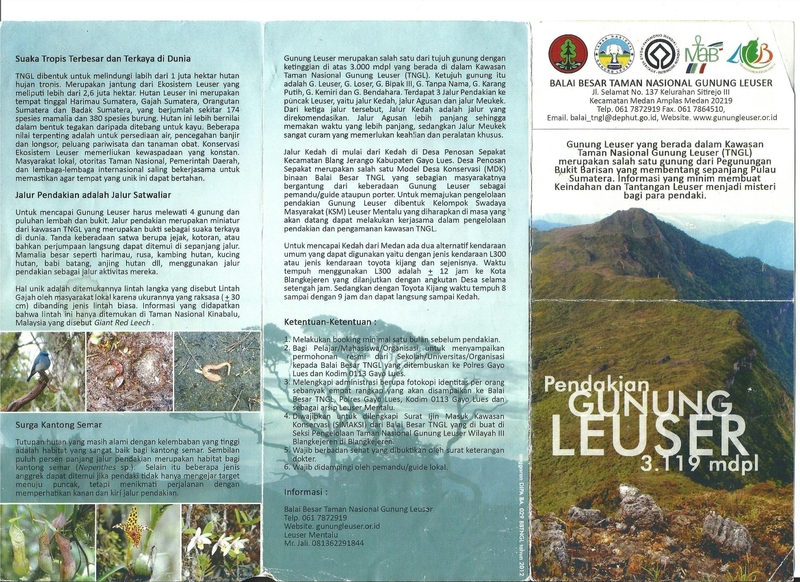 The brochure also identifies the location of Gunung ‘Tanpa Nama’. Gunung ‘Tanpa Nama’ is the highest peak on the Leuser Range and the second highest peak in Sumatra after Mount Kerinci (3,805 m, 12,484 ft). The peak lies inland from the escarpment, is easy to climb and offers spectacular views in all directions of five-six ranges of mountains in the distance each with declining hues of blue, as well as of the trekking route from Puncak Angkasan via the Pepanyi and Bipak ridges to the Leuser Range. It seems that few trekkers seek to reach its true summit as evidenced by the poorly formed track. The mountain has two knolls: a painted sign on the lower knoll (3,455 m, 11,335 ft) reads “Puncak Tanpa Nama” (summit of Mount ‘Tanpa Nama’). On the higher, more prominent knoll to the north-east, the true summit (3,466m), a plague embedded in a cement block reads, “Prof Dr Syamsuddin Mahmud, Governor Aceh, 1977 …”. The name, Gunung ‘Tanpa Nama’, literally means mountain ‘without a name’ in Indonesian. BAKOSURTANAL does not attribute a name to this peak on its 1977 map series; only the altitude of the lower knoll is indicated. A formal name for this peak may appear if and when BAKOSURTANAL issues new topographical maps of Sumatra. Gunungs Loser and Leuser, by comparison with Gunung ‘Tanpa Nama’, rise from the east with precipitous drop-offs on their western faces over the rugged escarpment towards the west coast of Aceh. Most trekkers set Mount Loser as their objective being the higher and more accessible of the two peaks. Both offer spectacular views. Leuser in particular offers unimpeded views of the west coast of Aceh – from Tampak Tuan in the south to Blang Pidi on the north in clear weather. The Ecology of Sumatra (Periplus, 2000. p. 310) informs that Loser is derived from a Gayo word meaning, “place where animals go to die”. Mr. Rajajalli, guide/operator, Rain Forest Lodge, Kedah, www.gunung-leuser-trek.net, provides a not-unrelated folklore story: a Dutch officer was hunting deer on the Leuser Range in colonial times and accidentally shot his hunting partner on the Loser peak. The porters, accompanying the party, used the Gayo word, los, meaning “dead” to describe the fate of the partner; Gunung Loser thus acquired its name. But how Leuser acquired its so-closely-related name remains obscure. The Leuser Range is one of the most remote regions of Indonesia (along with parts of Papua and Kalimantan). With an experienced guide and sound porters, it is an exhilarating but long and, in some parts, tough trek. Allow at least 10-12 days in total, including for bad weather/rest and 2-3 days on the Leuser Range if you plan on climbing all three peaks. Treks normally start at Desa (village) Kedah, Kecamatan (sub-district) Kuta Panjang, Kabupaten (district) Blangkejeren. There are two options: Kedah-Leuser-return, by the same route (12 days – about 120 kms); and, a much more difficult one-way route, Kedah-Leuser-West Coast (14 days), emerging somewhere near Manggeng or Labuhan Hajji on the west coast of Aceh. The latter is a serious undertaking requiring very experienced guide/porters and food carried from start to finish. For the Kedah-Leuser-return trek, food drops can be made en route thereby progressively reducing loads. Start Point: Kedah (1,220 m) is reached from Medan by car in one long day (or two days over-night at Berastagi, Kutacane or Ketambe). Kedah can also be reached from Bireuen, in northern Aceh, via Danau (lake) Takengon in the Aceh central highlands. (Suggested car hire in Medan: Pak Ramadhan, 0813 7018 3448). Guide and Porters: We began our trek at Rain Forest Lodge, operated by Pak Rajajalli (Jalli), 0813 6229 1844. https://sites.google.com/site/mountleusertrekking/home . Pak Jalli has much accumulated knowledge and experience having trekked in the region since 1981 and is dedicated to the conservation of the Gunung Leuser National Park. He will arrange guide/porters and permits. It may be easier to speak to his son, Rabudin, who in 2018 has WhatsApp (+62822 7222 6213) and email aneuk_leuser3@yahoo.co.id . Fees/Permits: as of August, 2014, the Gunung Leuser National Park authorities have set fees per trekker per day: Indonesian – Rp 5,000/7,500; foreigner – Rp 150,000/225,000. You need to email your plan well in advance and then visit the TNGL Park HQ in Medan to collect permission letters. Bring photocopies of ID/passports. For safety purposes, parties must be accompanied by an experienced guide and consist of a minimum of three persons. Maps: The relevant BAKO maps are series 50-0-ed, 0519-63, scale 1:50,000, 1977. The trek from Kedah to the Leuser Range is within this map. A second map, to the south, is needed for Gunung Leuser. These maps provide an overview of the terrain but, with a guide and GPS, are not essential. 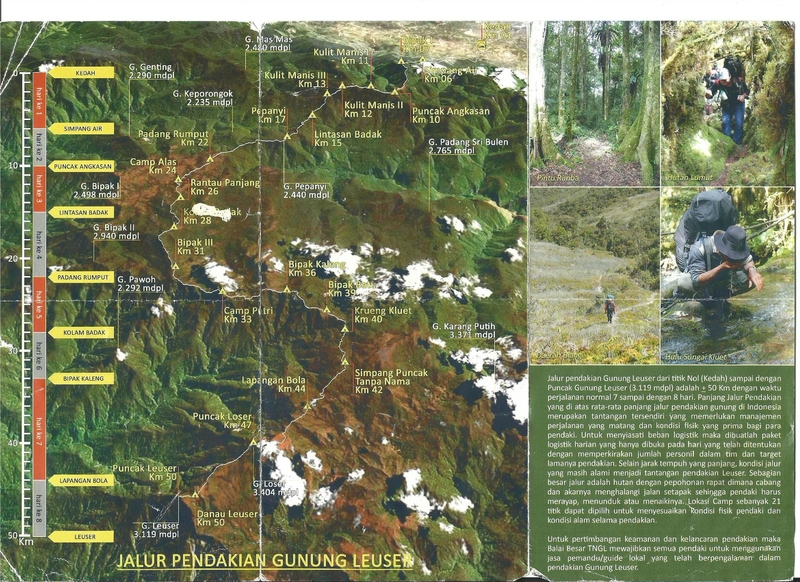 Ask your guide the Gunung Leuser National Park brochure: Pendakian Gunung Leuser 3,119 MDPL (Climbing Mount Leuser 3,119 m ASL) that shows the trek and camp sites superimposed on a satellite photo of the region. 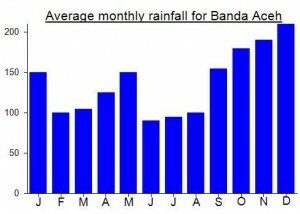 Trekking Season: northern Sumatera has two drier periods: February-March and July-August. The latter corresponds with university holidays when many groups undertake the trek. The Leuser trek is becoming increasingly popular amongst Indonesians and foreigners – some 10 groups in 2010, and 30 in 2014. Weather: Much of the trek is between about 2,400 and 3,000 ms. Temperatures drop to around 5-10 C before sunrise but are pleasant during the day. The weather is predictable most days: cloud (kabut) rising from the east and/or west around mid-morning often blanketing the entire region by afternoon when drizzle (grimis) begins; sometimes heavy rain (deras) in late afternoon/evening; late nights/early mornings are normally cloud free. Of course, substantial weather systems can come in from the Indian Ocean or South China Sea depending upon seasons. Rely upon your guide for when and where to set camp on account of weather. They don’t want to trek in the rain anymore than you do! The Track: Your guide will know the route, camp sites and seasonal sources of water well, and anticipate time and distance to the next camp and when/where to set camp. Don’t underestimate the degree of difficulty of the track – much is through moss/cloud forest, climbing up/down/over tree roots, negotiating “floating floors” of moss and peat, scrambling under and over fallen trees, etc. Prickly rattan plants are a continuous bother. Perseverance and stamina are required. Size of party and porters: we would advise that groups should not exceed four tents – camp space is often limited and, for every extra trekker, one or two additional porters may be required. Guide and porters also require tent/cooking space, which increases size of party and pressure on camp space. Discuss with your guide, in advance, whether you will carry your own heavy pack (or day pack only) so that porters can be arranged accordingly. Trekkers/porters should be prepared to share the load in the event of either being incapacitated. Trekking Days: Depending on your speed and good use of daylight, 10-12 days should be allocated for the trek: 5-6 days from Kedah to the Leuser range; 2-3 days on the Leuser range if your plan on climbing all three peaks; 3-4 days return to Kedah. Allow for delays due to rain (which are also opportunities for rest). The return trek normally takes less time because the trek is on average downhill, trekkers are fitter and loads much less. Camp Sites: These are numerous providing some flexibility when and where to set camp in the event of bad weather. Most are limited to 4-5 tents including tents for guide/porters who have their pre-determined places near the fire for cooking and warmth. In the interests of safety, agreed names should always be used for all campsites. Names used in this report are as per brochure issued by the Gunung Leuser National Park and endorsed by Pak Jalli, Rainforest Lodge. Water: during wet periods, water is available at most camp sites often in soaks, a hole dug in the ground where surface water accumulates during rain (exceptions: Camps Simpang Air and Perpayi). Water in dry periods is more problematic – see below by campsite. As there is no human habitation in the mountains, water is generally uncontaminated. Boil or use disinfectant tablets if you have concerns. Food: Our guide provided a basic diet of rice, mie and dried fish with onions and chilli for breakfast and dinner, and biscuits for lunch – plus tea and coffee. Foods such as muesli, dried fruits and nuts, freeze dried vegetables, cheese, Milo, etc are a welcome addition. Porters cook over open fires with a pot for rice and wok for mie, onions, chilli, etc. Your own small saucepan, mug and spoon will come in handy. Contingency Planning: Ensure that your group has adequate medical supplies. Think through what you would do if a member sprained an ankle or worse, the need for your group to split up, or emergency evacuation by stretcher or helicopter. Consider carrying a satellite phone. Camp Padang Rumput (2,404 m) has been used as a base for helicopter SAR. Overview of the Trek: The trek involves five stages corresponding to ridges traversed. Transferring from one ridge to another often involves steep descents/ascents. From Rain Forest Lodge, ascend via the Angkasan Ridge to Puncak Angkasan (2,916 m). Descend along the Kulit Manis (cinnamon) Ridge. Cross over onto Pepanyi Ridge following the upper reaches of the Alas River. Descend to and wade across the Alas River. Ascend and traverse the Bipak Ridge. After reaching the Krueng Kluet streams, climb up onto the Leuser Range. Rain Forest Lodge (1,346 m) or Resort, Kedah (1,220m): climb through local forest, tobacco fields and enter tall, dense lower-montane forest at the entrance to the National Park. About 100 m inside the Pintu Rimba, ‘entrance to the forest’, a path to the right leads to a campsite used by Rain Forest Lodge for wildlife tours; continue ahead – long, steep ascent (about 1,600 m) to Puncak Angkasan. Camp Simpang Air (2,270 m; 2:30 hrs; poor campsite, no potable water in wet/dry season): enter upper-montane forest; trees diminishing in height and density. Camp Bivak I (2,580 m; 1:30 hrs; reasonable campsite; 5-6 tents; no water in dry season); enter sub-alpine forest with moss forest in damp glades. Puncak Angkasan (2,916 m in elevation – prominence of approximately 639 m; 2:45 hrs): peak marked by a cement trig point, T3356 (survey plague removed by ‘trophy-hunting’ trekkers! ); short descend to ‘Angkasan Intersection’ where you can continue to Camp Angkasan (2,906 m; 0:15 hrs; good camp site; water) or, turn right and begin the descent of Kulit Manis Ridge. Kulit Manis ridge is characterized by knolls of burnt, regenerating scrubs and heavy undergrowth with moss forest in deep depressions. Camp Kulit Manis I (2,833 m; 1:00 hrs; 3-4 tents; no water in dry periods). Camp Kulit Manis II (2,750 m.; 1:10 hrs; 4-5 tents; no water in dry periods). From here, the trail drops steeply down into moss forest before rising towards the hilltop of Kulit Manis III. Camp Kulit Manis III (2,616 m; 1:15 hrs; 4-5 tents; no water in dry periods). The track now passes over to the Pepanyi Ridge. It drops steeply and enters moss forest with many trees/tree roots lying across the path before rising onto the Pepanyi ridge. This ridge follows the course of the upper reaches of the Alas River passing over two peaks, including Gunung Pepanyi (2,440 m). Most of the trek, until emerging into the open country at Camp Padang Rumput, is through heavy moss forest – laborious, uninteresting trekking! Tigers apparently frequent Pepanyi and have be seen unexpectedly! We did not see any tigers but did see their droppings. Camp Lintas Badak (rhinoceros trail) (2,333 m; 1:30 hrs; 4-5 tents; water). This trail, and four others that are crossed on the Pepanyi ridge (still quite visible), were used by rhinoceros when moving between the Alas River and their feeding grounds to the north – until they were shot out for their horns and became extinct in the area in the early 1990s (info: Pak Jalli). Camp Pepanyi (2,433 m; 1:45 hrs; 4-5 tents; no potable water in wet or dry periods). This camp site is in heavy moss forest, not comfortable, and should be avoided. A welcome respite from the moss forest is a wonderful view of a waterfall on the Alas River, about 0:45 hrs from Camp Pepanyi. 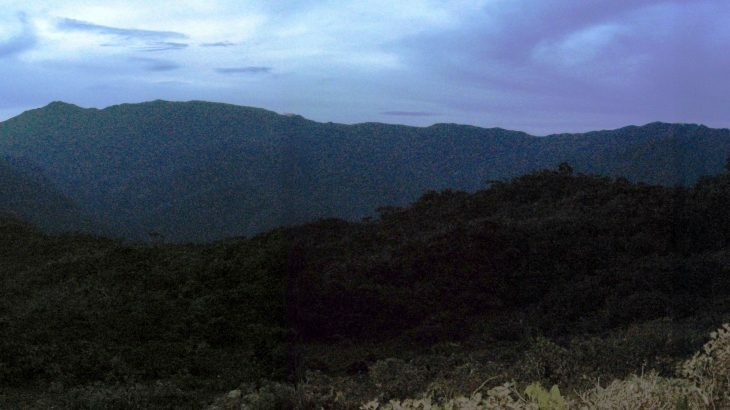 After about another 1:45 hrs, climbing up and over Gunung Pepanyi, the ecology changes abruptly from dense moss forest to open, low alpine bush on shallow soils derived from sedimentary rock. This point is known as the Pintu Rimba, ‘entrance to the forest’; water. Camp Padang Rumput (meadow) (2,404 m; 2:00 hrs; 4-5 tents; water from ‘soaks’). Porters favour this camp; open and relaxing, about half way through the trek, and offering first views of Leuser Range. From here, the track descends to the Alas River across open country and small streams with Rhododendrons in humid depressions. Wade across the Alas that, at this point, is normally a small, fast-flowing stream. Caution: flash floods can occur – anticipate heavy rain in the upper reaches before crossing. Camp Alas: (2,285 m; 1:00 hrs; 5-6 tents; pure mountain stream water); a very pleasant camp on the southern side of the Alas River. The track now ascends gradually through open country and several humid depressions; several depressions are of particular interest for the many varieties of orchids dominating the vegetation. Camp Rantau Panjang: (2,446 m; 1:00 hrs; 5-6 tents; no water in dry season). A pleasant, but exposed, campsite on a sloping grassy slope with views towards Leuser Range and back towards Puncak Angkasan. The trail now climbs steeply up onto the Bipak Ridge to alpine scrub dominated by rhododendron, magnolia, oak and other vegetation. The ridge comprises of a series of gentle knolls at around 2,900 m – pleasant trekking. The Bipak Ridge continues through Camp Putri to Camp Krueng Kluet. Our guide informed that Bipak means place of rest; maybe, Bipak is a transliteration of “p” for “v”, i.e., bivak, derived from the French/English, bivouac. Camp Kolam Badak (rhinoceros wallow); (2,733 m; 1:30 hrs; 3-4 tents; permanent waterhole). The tent area is not very flat. The waterhole is a reminder of the rhinoceros that used to inhabit the region. The track then passes over the highest point on the Bipak Range, Gunung Bipak III, (3,020 m). Camp Bipak III (2,982 m; 2:10 hrs; 4-5 tents; no water). Good camp site, with great views. The ridge narrows and the track, in places, follow the edge of the steep escarpment overlooking the rugged country to the west coast. Take care. Spectacular views towards the west coast begin to emerge. Camp Putri (2,940 m; 2:00 hrs; broad sloping area; 5-6 tents; water below). Great panoramic views of the Leuser Range and its peaks and of the terrain to the west coast. Fire wood is now exhausted – porters will wish to camp elsewhere. After an initial steep ascent, the track involves numerous ascents of alpine scrub knolls and descents into moss forest depressions until reaching the Krueng Kluet streams. This part of the trek is strenuous but compensated by great views of the Leuser Range as it comes into closer view. Camp Bipak Kaleng (2,940 m; 2:00 hrs; 4 tents); wet during rain; no water in dry periods. Camp Bipak Batu (2,950 m; 1:30 hrs; water; 5-6 tents); good camp with great views. From here, the track descends to the two streams, Krueng (stream) Kluet-1 and 2. Camp Krueng Kluet (on the second stream); (2,920 m; 1:30 hrs; 4 tents; pure mountain water). Camp Krueng Kluet marks the end of the extended Bipak Ridge. From here, the track climbs steeply up onto the Leuser Range; rather long and laborious! Camp Simpang Puncak Tanpa Nama, literally, ‘intersection to the mountain without a name’ (3,211 m; 1:30 hrs; water nearby but difficult in dry periods; 4-5 tents); also known more simply as Camp Simpang Tiga (T-junction). The track divides here: the left track leads to Gunung Tanpa Nama; the track ahead leads onwards to Gunungs Loser and Leuser. The true summit of Gunung Tanpa Nama (3,466 m) is reached through alpine scrub and meadows; an easy climb but, as few trekkers seek to climb this peak, the track is ill-defined and a guide who knows the track would be useful to navigate the scrub but not essential as the route to the peak is obvious. The mountain has two knolls: a painted sign on the lower knoll (3,455m) reads “Puncak Tanpa Nama” (summit of Mount ‘Tanpa Nama’). Some Acehnese hikers know this peak as Puncak Tribuana. On the higher, more prominent knoll to the north-east, seemingly the true summit (3,466m), a plague embedded in a cement block reads, “Prof Dr Syamsuddin Mahmud, Governor Aceh, 1977 …” The trek to the lower knoll takes about 1:15 hrs and another 0:45 hrs to the true summit. About 4 kilometres to the south-east is another very high mountain ridge known as Karang Putih, the highest point of which is around 3,371m and this is very rarely visited, usually on expeditions of at least two weeks. Camp Lapangan Bola (football field); (3,130 m; 1:15 hrs; 4-5 tents; water). This is a dry, sloping ridge above marshy swamps that can be very boggy after persistent rain. Gunung Loser is climbed from here along a well-used track. Cairns of rocks guide trekkers to the summit over ill-defined parts of the track during heavy cloud. Camp Summit Loser (3,404; 1:30 hrs; one tent at the trig point; water below; no firewood). A camp at the summit offers the possibility of spectacular sunset and sunrise views. Otherwise, camp somewhere below the summit (4-5 tents; closer to water; limited firewood) and return to the summit for sunset and sunrise. Gunung Leuser (3,119 m) is reached from Gunung Loser via the escarpment between the two peaks; about 1:45 hrs. Caution: in places the track overhangs the precipitous cliffs dropping down to the west coast. The track is not well defined as, it seems, few trekkers seek to climb Leuser. Camp Danau (lake) Leuser lies below the final ascent of Gunung Leuser; a delightful little waterhole especially if you wish to see the sunset/rise from Leuser. The return trek from Leuser to Loser takes more time as Leuser is some 250 m lower than Loser. A trek from Camp Lapangan Bola to Gunungs Loser and Leuser and return in one day is strenuous even for stronger trekkers. Better to camp at Loser, if time and weather permit, and make the trek to Leuser from there. Getting there: One long day to reach the trailhead from Medan. Unless you arrive on the first flight of the day it is better to spend one night en-route. In 2018, a car and driver from Kuala Namu Airport to Kedah is Rp2,200,000 (one way!) but a seat in shared travel car from Medan to Blangkejeren is just Rp170,000 per person. Permits: Rather complex, and certainly not easy for those who are quite reasonably expecting an efficient process to allow them to go hiking. As of August, 2014, the Gunung Leuser National Park authorities have set fees per trekker per day: Indonesian – Rp 5,000/7,500 (weekends and holidays); foreigner (even those who have KITAS/KITAP) – Rp 150,000/225,000 (weekends and holidays). Bring photocopies of ID/passports and best email the National Park in advance using bbtngl.pemanfaatan.pelayanan@gmail.com and/or WhatsApp message to Lila on +6281362228752. You need a formal letter to the head of the Park requesting permission for your group to hike and giving details such as equipment used and itinerary. Taking photographs on the trek using your handphone is fine, but if you wish to use a traditional camera then you are supposed to pay an additional Rp250,000, which seems rather excessive to us. You also need to pay a small sum for ‘materai’ (stamps over which you sign the contract) – these stamps costs Rp6,000 each but you may need 5 or more for your group. You also need a recent Doctor’s letter for each trekker saying that he or she is fit enough to undertake the trek. You need to arrange permits in advance with the office on Jl Selamat in Medan, North Sumatra and sign and collect the ‘SIMAKSI’ on the way to the mountain. For safety purposes, parties must be accompanied by an experienced guide and consist of a minimum of three persons. Note that women should be prepared to wear a jilbab in Kedah and Aceh in general, but thankfully it is not essential once you are trekking in the mountains. Water sources: Your guides and porters will advise how much to bring, but best have two water bottles per person to fill up as you go on. Nanggroe Aceh Darussalam Sangat Tinggi. permalink. I’m back in Jakarta early, after turning around just a few hours into the Leuser hike. The other 3 hikers, plus 3 porters and one guide, have continued and I hope their expedition is a success and that they have decent weather. The following is an outline of what happened, from the very beginning of planning the hike to deciding to turn around and go home early. Obviously a trek of this length (10 days, 50 something kilometres each way = over 100km return) needs planning well in advance if you have a regular job and limited time off work, and to keep costs reasonable you need a group of 3 or 4. More than 4 and you may struggle to have enough comfortable i.e. flat space at the small camp areas. Once I had the dates fixed based on the term dates at the school I teach at, the response to my email invitation to those on the Gunung Bagging mailing list to join was pretty poor, but this has been the way of things since the beginning back in 2009. Folk tend to want to join trips to famous places over 2 or 3 days (eg the 3000m volcanoes in Java), but anything more obscure or long is much less popular. Finally, 3 experienced Indonesian hikers joined so we were ready to start on planning the trip properly. I was really looking forward to it, but a little bit apprehensive about such a long hike in terms of days away, and had a good chat with Nick in Jakarta about his experiences having hiked the range twice. The paperwork for Leuser is laborious now and – for foreigners – expensive. Whereas in previous years you could simply show up at Kedah near Blangkejeren and find a guide ready to set out the next day or so, more recently everything is much more formal and time-consuming, involving submitting requests and plans to the Taman Nasional Gunung Leuser office in Medan. I emailed the Park but received no reply for several days but managed to get a WhatsApp number for a staff member from a guide at the foot of the mountain itself. I began by asking for the cost of SIMAKSI (basically permission to go hiking in the Leuser range) and they confirmed the daily prices – including the rate for non-Indonesians being 30 times (yes thirty times) the rate for Indonesian hikers. This is based on an Indonesian law which mentions only nationality (WNI – Warga Negara Indonesia versus WNA – Warga Negara Asing) and makes no room for the many foreigners who live, work and pay taxes locally here in Indonesia and thus already contribute to things like National Parks. Thus, a KITAS holder still pays 30 times the local rate per day. As we were going as a group of 1 foreigner and 3 Indonesians and I was the one doing all the arranging of permits, transport, guides, etc, we would split costs equally, but I – perhaps unwisely – mentioned to the Park staff that this was unfair discrimination given that I am a KITAS holder and that such treatment of foreigners in many countries would be illegal. After this, the Park staff member became less responsive so I ended up being put in touch with another person at Park HQ in Medan to sort things out. The cost for a permit for a 10 day hike would be Rp1,752,000 in total, the majority of that being the cost of the 1 foreigner participating (me). This is not a nice way to get things started, but if you are a foreigner you have to simply accept this discrimination and hope the hike is worth it, or go somewhere else where you will be treated less as a foreigner and more as a human being. You need health certificates stating you are fit to go hiking. These are simple to get hold of anywhere for a very modest fee if you have a BPJS card, and should be less than Rp50,000 even as a tourist. You need to email these along with your photo ID to the Park office in advance. You also need an outline plan for your hike itself. I was not provided with any guidelines, so simply wrote a letter in Indonesian asking for permission from the Park office to hike Gunung Leuser for ten days (March 20-29th 2019) plus the names, ID numbers, ages of the 4 participants. I sent this well in advance along with our IDs and health certificates. Despite the Park office receiving this months in advance of the hike, it was only the day before we were due to collect the permission documents that I received a message saying that it was not sufficiently detailed! They forwarded an example from a Malaysian group who had recently hiked, which additionally detailed a reason for hiking (surely enjoyment of hiking should be enough but they expect a paragraph about interest in flora and fauna or similar), plus a detailed outline of each day and where you would be camping. Now, as any guide will tell you, it is virtually impossible to state with much confidence exactly where you will be camping each night on a ten-day hike, simply because that depends completely on the fitness and speed of the participants and the weather. But it seems it would be better to concoct something for this even though you know the reality is likely to be very different indeed. I simply replied that the guide was taking care of food and camp places would be largely determined by the weather. Perhaps realising it was unfair to wait until the last day after months of planning to request a new document, the Park staff used a standard template for the updated hiking plan document. If only they had sent me this example in the first place back in November. You should also mention logistics, even though you will presumably have arranged this with your guide. Indeed, I sent 4 million rupiah in advance to Bang Rabudin (son of Pak Jally) to purchase all the food in advance so that we wouldn’t waste time on Day 1 waiting for them to go shopping. 4 million covers food for 8 people (4 participants plus 3 porters and 1 guide) so it works out at Rp50,000 per person per day for a 10 day hike, although they will buy a little bit more than strictly needed just incase you need to stay out on the mountain for an extra day or two. You could legitimately question having to pay for the food of porters and guides who are already getting paid for their work and would have to spend money on food even if they were sitting at home doing nothing instead rather than out on the mountains, but it seems to be standard, especially for these longer treks. You will also need to take snacks of your own unless you are happy with simple meals that will be rather monotonous after a few days out there. Light, nutritious things like muesli bars are recommended, plus special treats such as cheese or whatever. Finally, the day arrived and we met in Medan to collect the paperwork from the HQ on Jalan Selamat and then head to the mountain. It took 1 hour to get to the office from Kualanamu airport, along congested narrow streets for the most part. Distance from Medan to Kedah near Blangkejeren is around 300km and requires around 10 hours (you really need to allow 12 to include traffic problems and meal breaks). Note that you could fly from Medan to Takengon using Wings Air – Takengon is only around 5 hours by road from the usual starting point at Kedah. However there are two issues with this…. There is a 10kg weight limit for Wings Air and it doesn’t seem likely that you could get permission to hike in Takengon. Thus, you need to stop in Medan on the way to get the paperwork to be allowed to hike. You would think this would be straightforward after having told them of your plans several months ago. I told our driver I expected it to take about 20 minutes, after which we could get breakfast and be on our way on the long journey by road to Blangkejeren. Well, it ended up taking 2 hours and 20 minutes. I needed to provide 5 Rp6000 materai stamps for various documents. I had these ready, fortunately, or else it might have taken even longer. At times as I sat there, never once offered a coffee, I wondered if they were deliberately taking as long as possible in retaliation for me having weeks before said it was unfair to charge foreigners 30 times more and that I was not receiving sufficient responses from the initial Park staff I communicated with, or whether it was simply corruption-free Indonesian bureaucracy in action. Certainly, aside from the admittedly important factor of doing things the legal and proper way by visiting this office, there is very little incentive for hikers to have to suffer this procedure compared to just showing up in the village and seeing if it could be taken care of locally rather than in an office 300 kilometres away in a different province. Near the end of this awfully long wait, one staff member returned from another building with 8 identical letters and envelopes. All of these letters needed folding and names of those they were meant to be delivered to written on the front of the envelope. One of these was our copy. Others were for a local mayor, the local police, plus various rather obscure addressees including for some bizarre reason a small immigration office in Takengon. Quite who would be expected to deliver the Takengon letter was not mentioned at all – it’s a ten hour return journey by car from the starting point! Anyway, it was taking him so long to prepare these that one of our team starting helping him by folding the letters! Surely one for the local police office and one for us would be sufficient. If the National Park management genuinely has an interest in increasing the number of visitors to Gunung Leuser, it is pretty clear that they need to take a look at how they might make the procedure a lot, lot simpler and less time consuming. At present it is hard work – even vaguely traumatic. Who on this planet wants to spend their leisure time waiting for literally hours to be given permission to go trekking? Perhaps the powers that be are not interested at all, or perhaps they are simply incapable of seeing how this might not be the best start to a trip, especially when you have another 300km to travel to get to the starting point (where it would be much more convenient to be able to obtain permission). All of these things are blindingly obvious, so why do those with the authority either not see them or have no interest in improving matters? It is utterly mystifying, like something out of a Kafka novel. And to someone like myself who has spent a vast amount of time and money visiting and writing about the mountains of Indonesia for nothing but the sheer pleasure of mountaintop views it is pretty disrespectful. It was lunchtime by now, and we hadn’t even had breakfast, most of us having flown from Jakarta at 5am and then gone straight to this office. We still had a very long car journey ahead of us – if you have the time I would recommend breaking the journey at Berastagi, Kutacane or Ketambe. The roads are windy and for the first section from Medan to Berastagi to Kabanjahe utterly clogged with trucks and in need of resurfacing and widening. It was fascinating to see so many churches over the border in Aceh as far as Kutacane – I expected zero churches and 100% jilbabs from the borderline but the reality is far from that as many Batak folk live as far up as Kutacane and there appears to be no visible problems whatsoever at present. It is a shame the tiny Alas Leuser and Blangkejeren airports are either too small or simply closed permanently for Wings Air to fly here as it would be ideal to save such a long drive in from Medan. The mighty Alas river appears at one point on the left of the road…. And there are a few short landslide areas where tributaries have become swollen and destroyed riverside houses as the water rushes down into the Alas river, most notably at Natam. There are a couple of checkpoints – one at the border and one further up beyond Ketambe, but these are more of an issue for travelling back south again from Aceh, as police seem to be focussed on preventing marijuana from being transported from Aceh into North Sumatra to be sold. We called off at the Wisma Cinta Alam guesthouse and restaurant. After a lengthy storm and torrential downpour they had no electricity but they got the generator started so we could have a meal. Nice menu – clearly they see quite a few Western tourists here for the orangutans. I said as we were worrying about getting back after our hike in one day in time to check in around 4pm at Kualanamu that staying here on the way back (Rp150,000 per person) would be a good idea as we would be 3 hours (approximately) nearer than Kedah. Kedah is not in Google Maps (except for Kedah in northern Malaysia) at the moment. Basically you need to search for the nearby town of Blangkejeren, Kedah is a few kilometres west of there around 15 minutes more by car. Blangkejeren has plenty of food shops, a petrol station, probably an ATM or two, plus a ‘travel’ (shared car service to Medan). The turning to Kedah is easily missed – a left turn with a few signs including one mentioning trekking to Loser and Leuser. We arrived quite late – around 2230 or so – after the long day flying from Jakarta, waiting for the permit in Medan and then the long drive. There appears to be two accommodation options at the trailhead – in previous years you could stay on the edge of the forest, about one hour on foot from the village. Now it appears the simple resort/resor building in the village of Kedah is the place for hikers to spend the night prior to starting the trek (and also upon their return if required). Payment for staying in the simple building with a squat toilet and mattresses and a plug socket is up to you – Rp100,000 per person should be more than enough. Iff you need wifi just ask. You can buy simple snacks and water at the warung opposite but they had no large water bottles when we were there so I would recommend buying 2 big aquas enroute (eg. in Berastagi or Kutacane). Bang Rabudin obviously knows what he is talking about, having hiked the mountains many times and now seemingly in charge of operations for the Leuser trek as his father Pak Jally gets a little older and leads less lengthy hikes. So I was a little disappointed after previous communication to find that Bang Rabudin would not be our guide. We gave them half payment in advance to give to their wives. He also needed a copy of our IDs for the local police, in addition to the permission letter from the Park office. He took photos on his phone. It seemed to be particularly important for me as a foreigner and it sounded like if I hadn’t had a KITAS I would have had to visit Blangkejeren police station before we could start – a real fuss is made over foreigners and it can get quite tiresome dealing with administrative task after administrative task. At Rabudin’s house we had a simple breakfast and asked him about Leuser animals. Not many leeches he said, and not many snakes either. He showed us a framed photo he had taken of a Sumatran tiger up on the Leuser range at Camp Lapangan Bola – which is a favoured camp spot before Loser and Leuser peaks. He said tigers had been encountered in both 2017 and 2018 and that this photo was taken from just 30 metres away from the tiger, which sat down watching them as they looked down from trees that they had climbed for safety. He said he also had video but it was shaky because he was scared. I was very surprised by this, because since my first hikes in this part of the world in 2009 the prevailing narrative about tigers in both Sumatra and the Malaysian Peninsula is that hikers will not see them and if tigers are aware of hikers they will avoid them. Certainly you only very rarely hear of hikers seeing tigers here. It is normally stories of individual plantation workers being killed by tigers on the lower edge of forest from time to time that make the papers – and that the tigers descend to the edge of the plantations as there is insufficient food for them in the forests due to deforestation and so on. In July 2013, there was one group of six locals from Simpang Kiri, Aceh Tamiang, searching for an expensive type of incense wood to sell. They were in the huge Leuser Park area but not anywhere near this trail from Kedah and caught a tiger cub in a deer trap allegedly by mistake. Before long they had at least 4 angry tigers surrounding the trees that they had climbed. One man fell down when his branch broke and he was mauled to death. Were they really just trying to catch a deer to eat or actually poaching tigers? Its difficult to know one way or the other, given how much money can sadly be made from tiger parts. But this was by all accounts a one-off and all hikers tended to see was tiger droppings from time to time. So quite worrying to hear of actual encounters with tigers recently, as if the number of meetings was growing. Why would this be? Are the tigers becoming more accustomed to the presence of hikers, or are they retreating to higher parts of the mountains as the lower parts continue to suffer deforestation and encroachment by humans. It apparently followed them for a full day, getting as close as just 5 metres, so they were able to take photographs. It appears they were about to set off back down the mountain, so it is quite possible this is the same tiger that Bang Rabudin saw at Lapangan Bola. But this group don’t appear to have climbed a tree to avoid it, although it could certainly have caused incredible harm to them had it so wanted and they can of course also climb trees if they wish. Given our guide’s name was Jul or Jol, I wondered if it was he who had previously sat at the place where the tiger appeared for this group. Have a look at the photo on the link above, a beautiful but fierce tiger in the mist just meters away. Full marks to the team for remaining calm as running away can cause the hunting/chasing instinct to kick in. Many Indonesians may well say this creature was some kind of ‘siluman’ spirit. It is most peculiar how it got so close but caused them no harm. Personally I think the risks to hikers is underestimated and underexplained and worry that conflict situations could occur in the near future. We were aiming to start at 8am (in order to make a full day out of Day One instead of a half-day which what others have told me often happens if the guides and porters still need to buy food in addition to packing everything). We got started at 0845 which was alright, but one of the porters was still busy with something as the rest of us began. From the ‘resor’ building, we followed the road up to the school where you take a right, head down a little, over a bridge, up again and then a left onto a wide, muddy track up into the hills. We were doing fine until we realised our guide and porters were nowhere to be seen. We continued, then took lengthy breaks, looking back to see if we could find them. No sign. We continued to a few hundred metres before the forest entrance (1,700m) and waited in a grassy depression, listening to the many siamang calls echoing across the valley. I walked back several times, looked down to see if I could spot the guide and porters – nothing. Had we gone the wrong way? There were no signs but we were on the only track of any decent width. After an hour of waiting myself and one of our team were growing quite annoyed and restless. We had been hiking for 2 hours, and slowly with rests. What on earth were these boys up to? We had paid them half already and they knew of the plan to hike today many months ago. But like the office experience the day before, we were being expected to wait, with no reason given. My phone was off – to be used in emergency only during our ten days – and I really didn’t want to waste battery power so soon but decided we would have to phone Rabudin to ask what was going on. We did, and he called back ten minutes later to say they were on their way. Quite worrying though – you need real confidence in your guide and porters for a trek of this duration, and especially given the increased number of tiger encounters reported in the last couple of years you need to stick together in a group and be within shouting distance / ideally visible. Finally after a wait of 90 minutes, the guide and porters arrived. It had taken them 3 and a half hours to reach this point that it had taken us just 2 leisurely hours to reach. They were carrying heavy loads, as was I, but 90 minutes is a long time, so I was concerned that this might be typical of what we would expect for the following ten days. My friend Mykhailo hiked to Loser in much less than 10 days, and the Malaysian team allegedly took only 7 days to reach all three main tops. I enjoy hiking when I am actually moving and don’t like waiting around unless I am at camp. I wanted to have a quick meeting to see what had happened and try to ensure that we wouldn’t have similar again, but everyone was on the move again. I was wondering what I was doing, having endured the lengthy administration in Medan the previous day and now this long delay so close to the start of the hike. It wasn’t enjoyable, and who but a fool pays lots of money and spends his precious holiday time doing something that he isn’t enjoying? I decided to turn back. I gave some cash to the last member of our team and put my backpack on. I would find my way back to Jakarta myself. I suppose it was a combination of things… the lengthy bureaucracy, the tiger stories, the being far from my partner, the expense, the long wait at the very beginning of an epic trek. Why not find a hobby that uses up less money and is more pleasurable… as much as I love the mountains they can be very expensive and time-consuming here, and if you are getting frequently annoyed as part of this experience then it seems a really strange way to spend one’s time. Bang Rabudin was sorry, and very kindly arranged a seat in a ‘travel’ back to Medan for me. I told him I didn’t like the long wait, wasn’t feeling confident and thought I needed an indefinite rest from the mountains. He had received a message from the group to say they were at Simpang Air camp area and would be spending the night there. Given my efforts to send money in advance for food in order to make Day 1 more of a full-day hike than a half-day as friends of mine have experienced in the past, I can’t say I was regretting my decision to turn around when I heard they had only made it to the first camp area perhaps a maximum of 3 or 4 hours’ walk from the village. I would have been aiming for Angkasan itself on Day 1, especially after Nick’s comments in the write-up above that it is a ‘poor campsite’. The seat in the ‘travel’ car was a very reasonable Rp170,000 for the ten-hour car ride back to Medan. I already knew this was likely to be ‘an experience’ and indeed it was. The driver was very friendly indeed, but had to make various detours in Blangkejeren to buy his favourite brand of cigarettes. We also had disco dangdut blaring out of the car stereo for almost the entire drive…. Tinny, moronic music but with an inane beat that keeps drivers awake better than red bull. At one of the many sharp bends in the road, the driver spotted a kitten, jumped out and grabbed it and put it in the back for a few hours before depositing it somewhere more favourable! We were in Medan at around 630am the next morning and I was on my way back home with disco dangdut reverberating around my skull. I hope the rest of the team will understand and forgive me for walking out and that their trip, still ongoing, is an enjoyable success. Almost certainly doing a trek here March 19-30th 2019. One space left – get in touch ASAP if interested. Dan. Hai, I’d keen to hike Leuser, but I need more info about your plan trip to this mountain. Would you share it? Especially the cost. Thank you. Can u give more info on the forthcoming 2015 expedition? thank you! There are 5 local guys currently stuck up a tree surrounded by 4 tigers in the Gunung Leuser area. They have been there for three days after having accidentally caught a tiger cub in a deer snare. The 4 adult tigers arrived and ate a 6th member of their party (which had originally gone looking for the incense wood that can fetch a high price). Apparently it could take another couple of days for a proper rescue team to reach them. The Leuser Ecosystem is one of the most important conservation areas in Asia and is realistically the last hope for the Sumatran species of Orangutan, Rhino, Elephant & Tiger. Java Lava are planning a Leuser expedition in September, see….